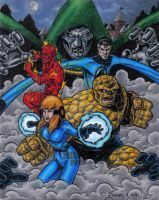 Celebrating the Fantastic Four's 50th Anniversary! Drawn with No. 2 pencil, marker wash background, and colored digitally. It's beautiful and her dress is bedazzling! Thank you so much, hun. I was thinking more Jimmy Stewart and Grace Kelly ala Rear Window lol. This is so beautiful, especially her dress! There's definitely some Grace Kelly in her! Rear Window is one of my favorite classics, and (probably no surprise) I was watching it while I worked on this piece. The dress was absolutely on of my favorite elements to work on. So happy you like it! starring jimmy stewart and donna reed?! I had something like this done a while back. Beautiful.